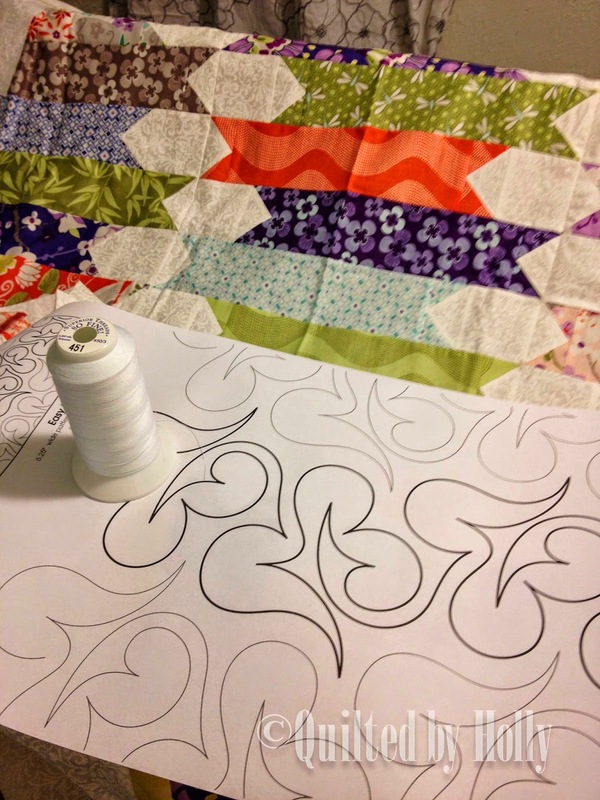 The hardest thing about quilting for me is knowing what pattern or design to stitch and where. 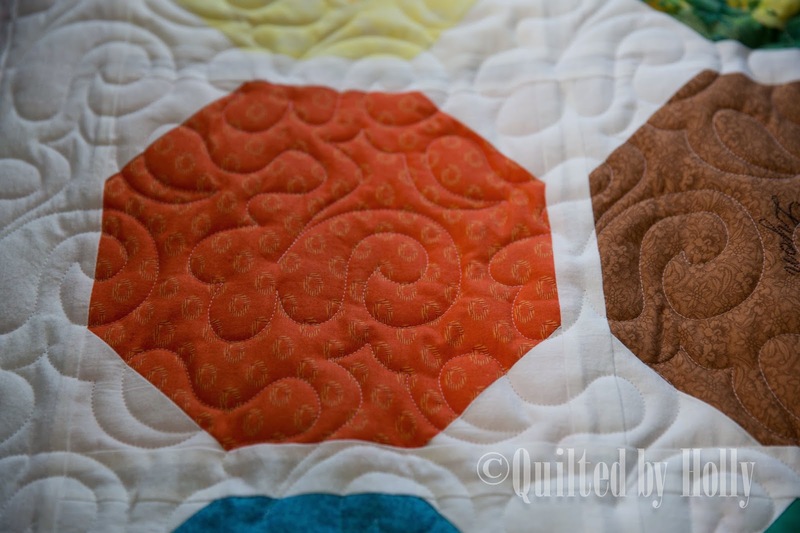 My friend Kristen gave me a simple hexagon pillow sham and asked me to quilt it. I drew out a design and was so pleasantly surprised at how it turned out. 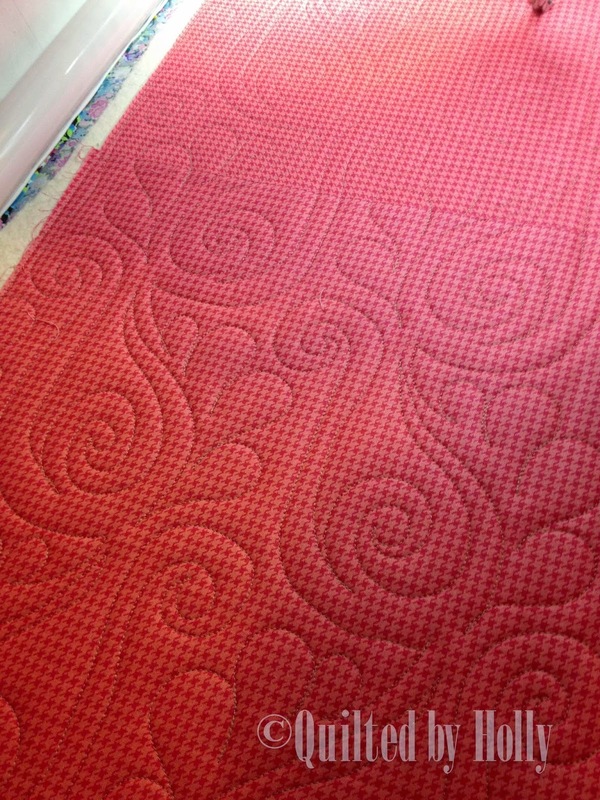 I'm still practicing my custom quilting and this I have to say is quite possibly my favorite thing I've quilted so far. 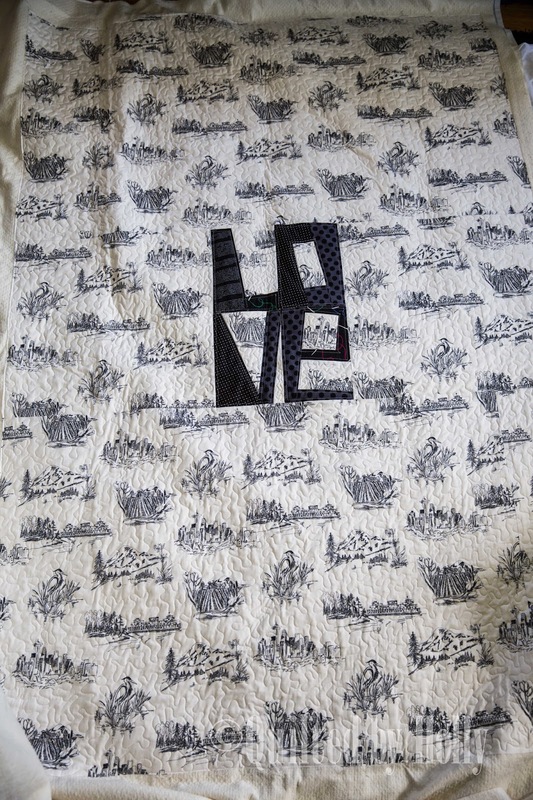 The last of the Love quilts made by Ann! 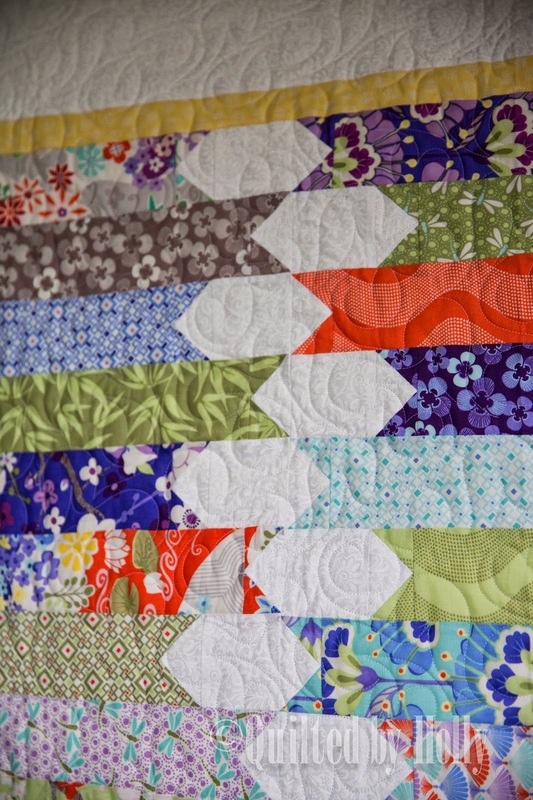 I have lost track of how many total I quilted for this special occasion (daughter's wedding!) but it was fun to use so many of my pantographs to get different results. 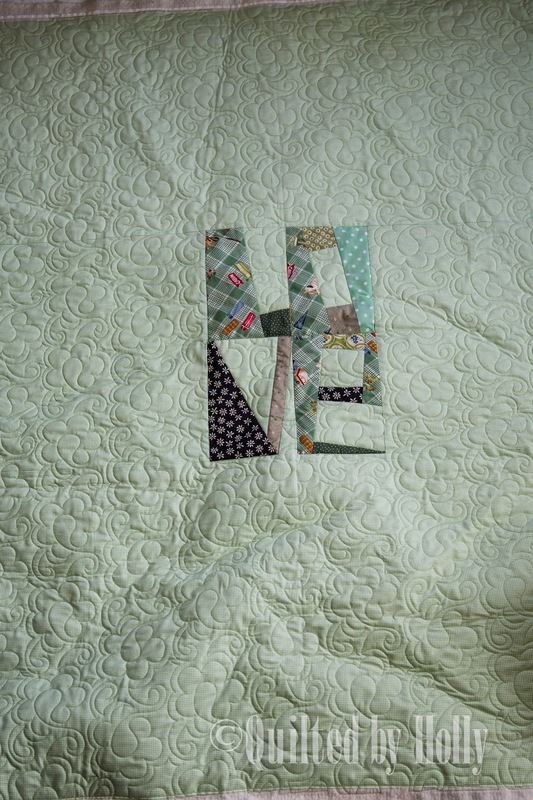 Thanks for letting me quilt for you, Ann!!! You certainly kept me very busy! 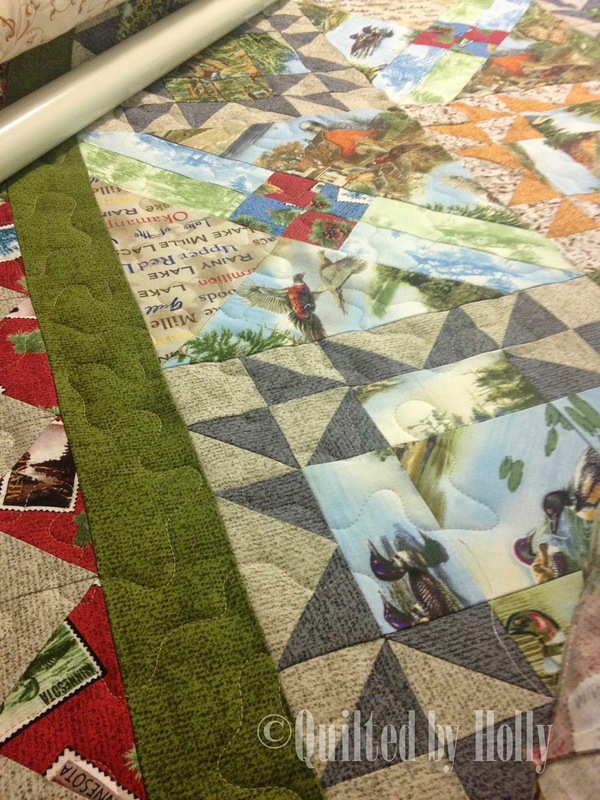 One thing I really appreciate about quilters is the camaraderie it can create between groups of people. 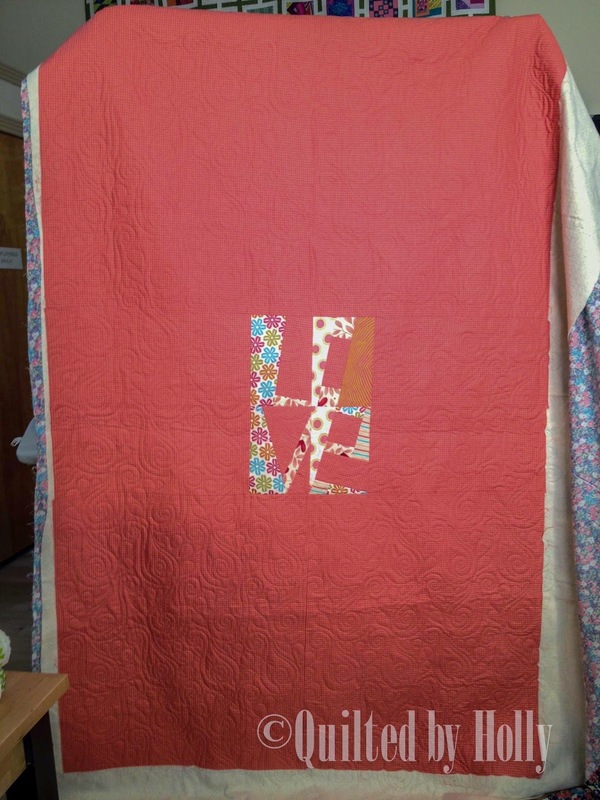 This is a special quilt from a local church that was made by its members for their pastor who was leaving. 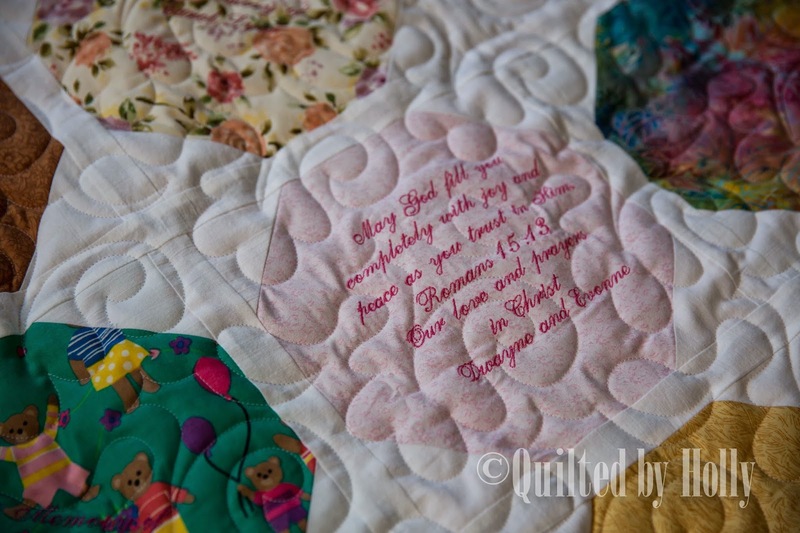 Most of the blocks were machine embroidered with messages from church members, Bible verses, and names. Gifts like this are such a treasure. 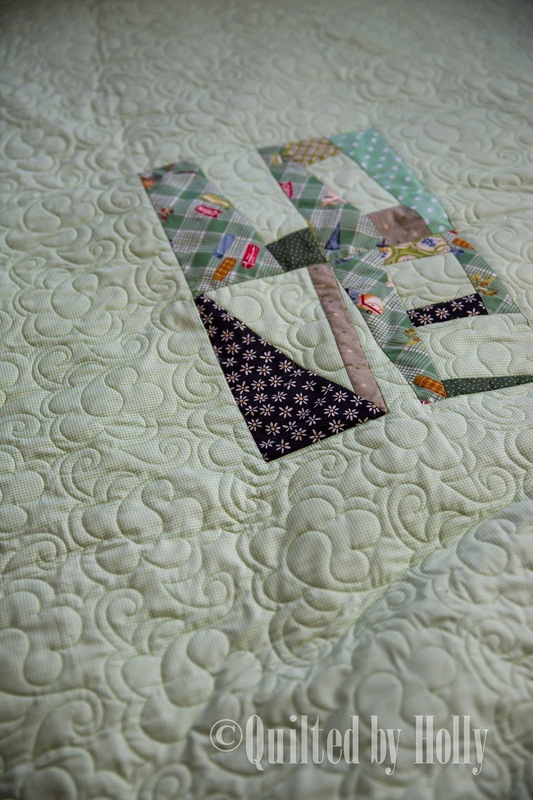 I quilted this using "drift". 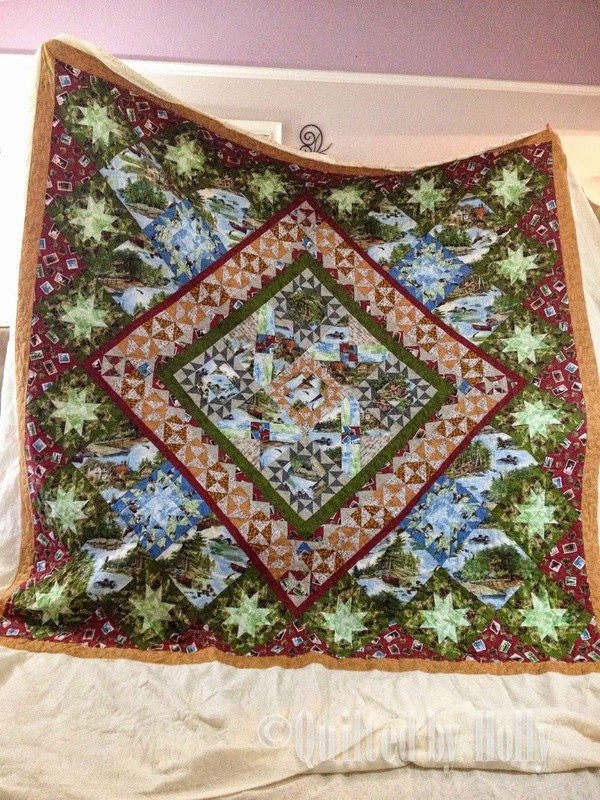 One of the sweetest quilters I know, Venus, made this quilt for a retiring co-worker. 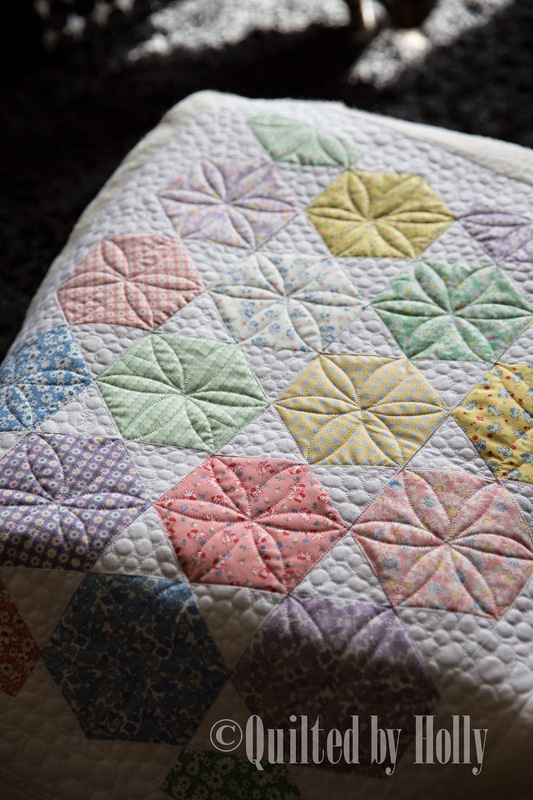 The quilt pattern is called "Good Fortune". 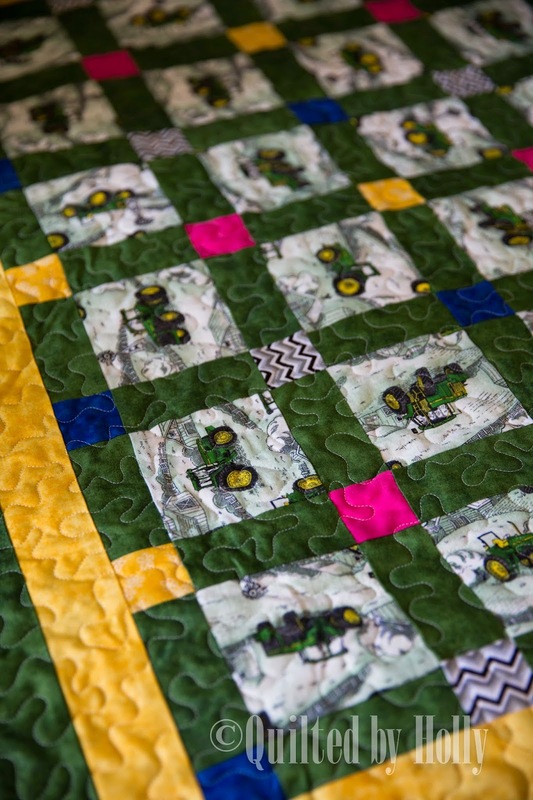 This might be the best quilt name I've heard for a person retiring!!! The pantograph is called "Easy Street". 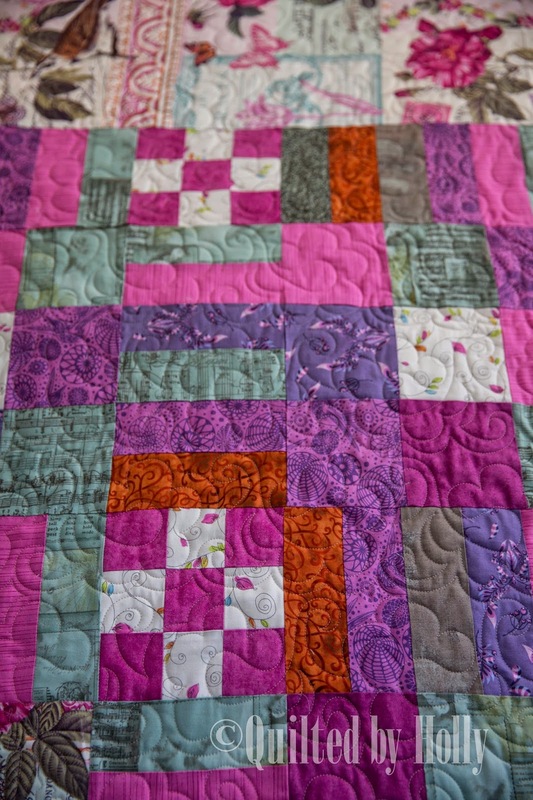 I really like this pattern "Paisley Playtime". 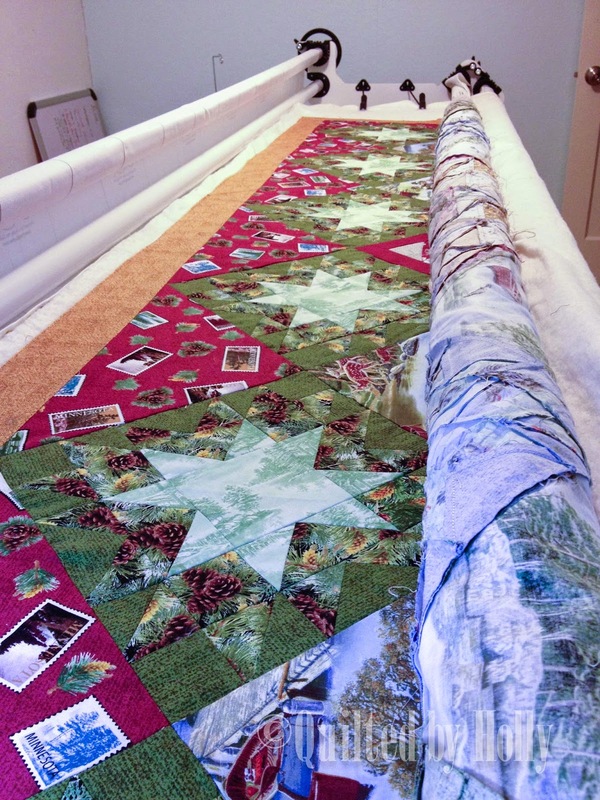 It's fun and happy and works well on many different quilts. 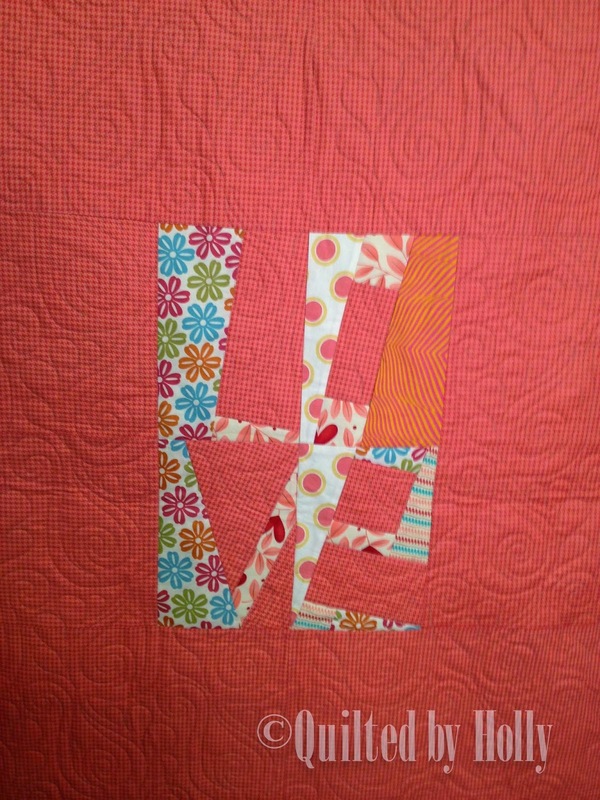 Kristen's love quilt for a dear friend going through chemo. 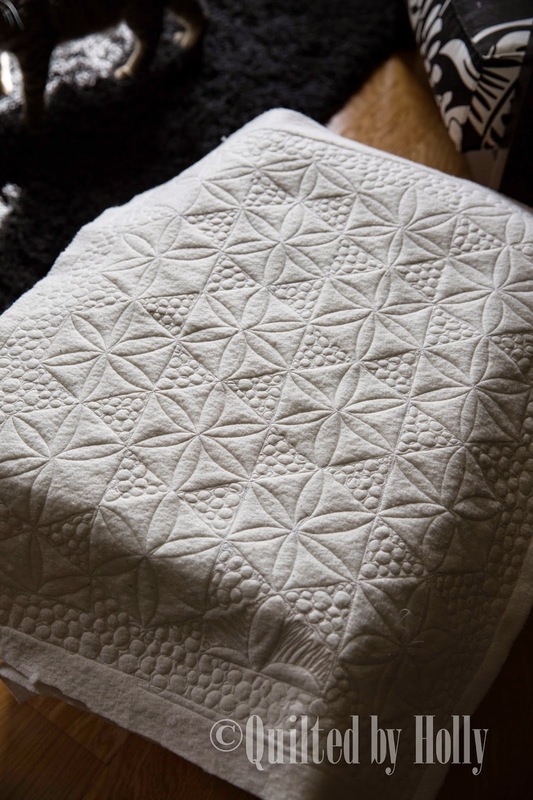 It's backed with minky - so soft and perfect to snuggle with! 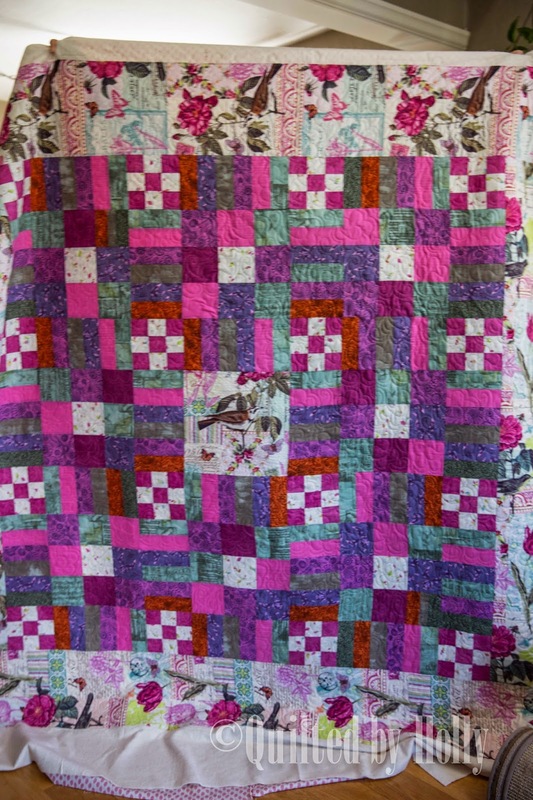 This quilt was made by Sue. 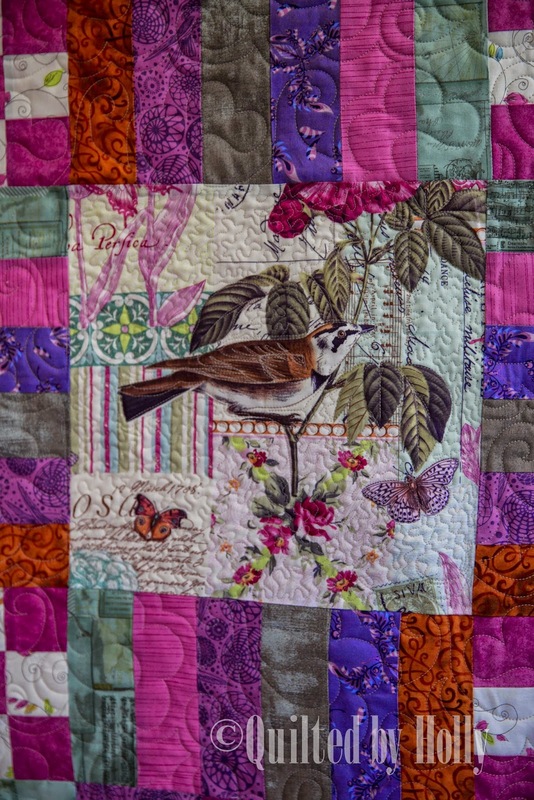 The quilt pattern is "Sophia's song" by Geri Robinson. 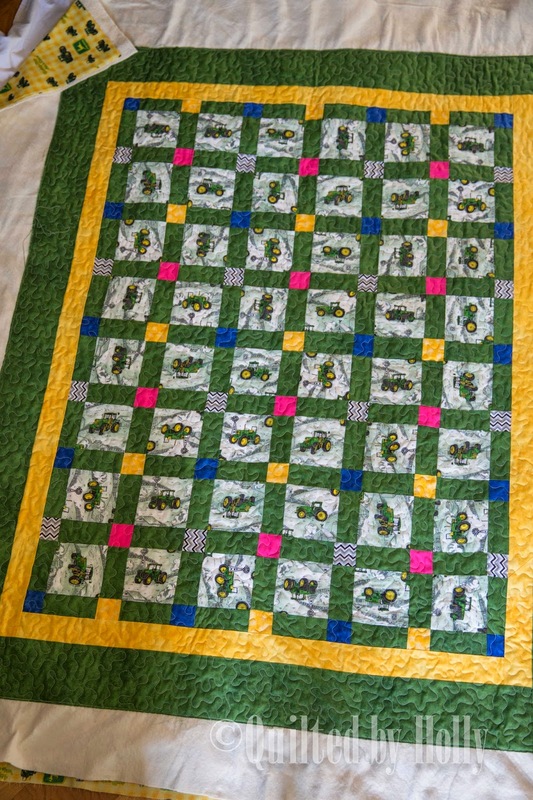 Sue wanted her center block to pop so I did some custom quilting to highlight the bird, leaves, and butterflies and micro-stippled the rest of the block. 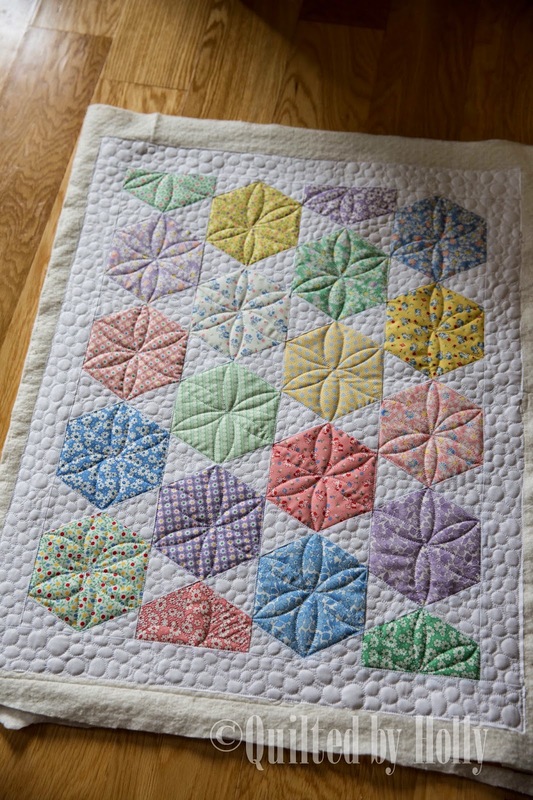 Pretty fun quilt, Sue's 2nd quilt I believe! 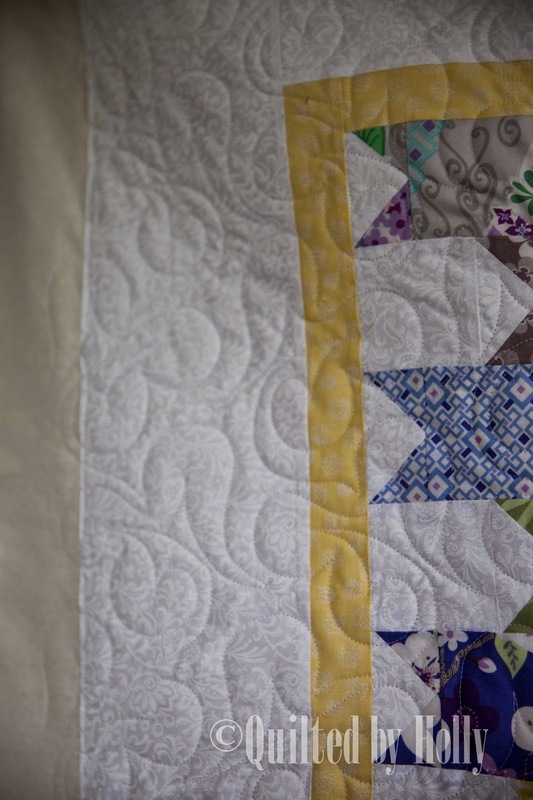 This quilt turned out so fun! 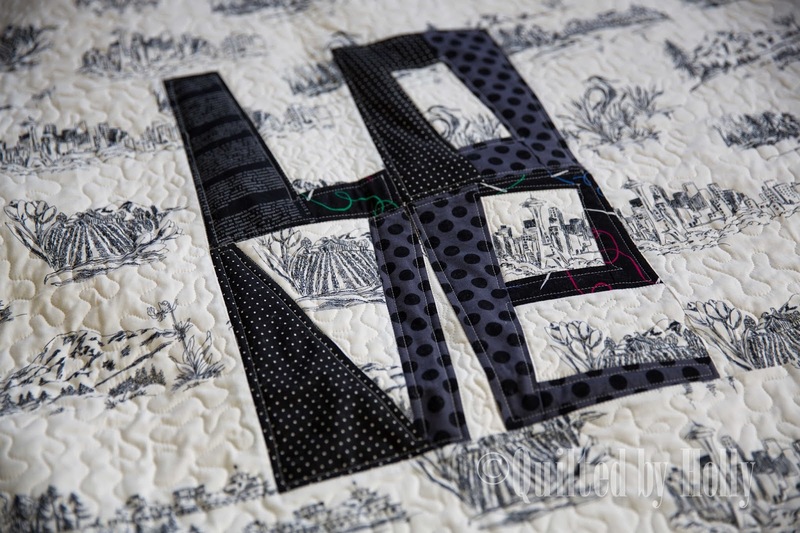 Bayside pantograph is such great pattern! 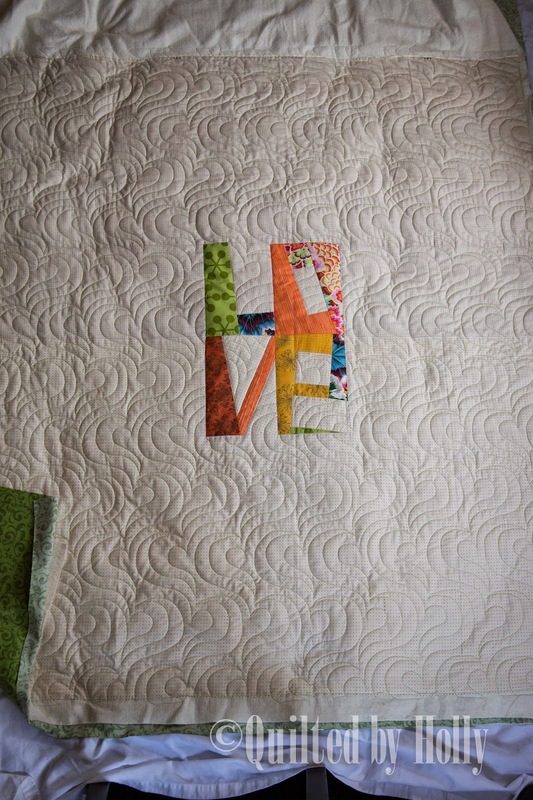 I wish you could see this quilt in person (every quilt for that matter!). The background fabric is a white/green small print. The bright Love letters really pop! 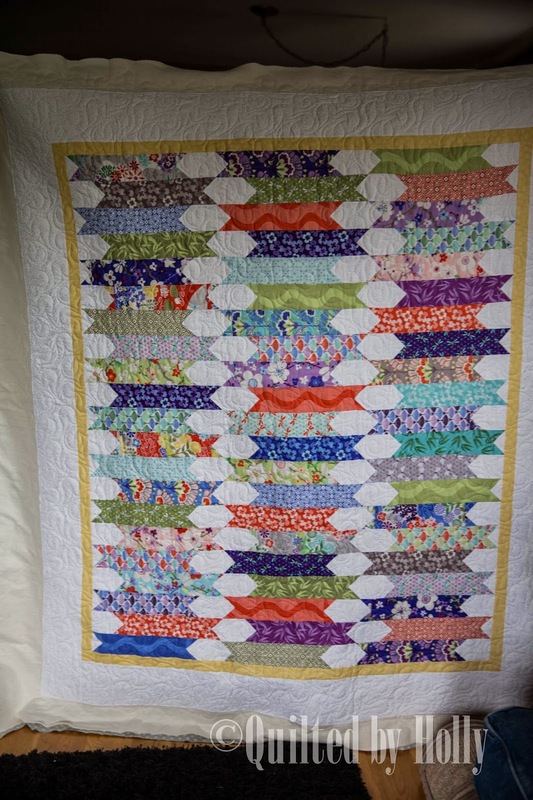 Ann made this quilt, another for a bridesmaid at her daughter's wedding. What a great gift!! I am very overdue for updating my blog on projects I have been working on. 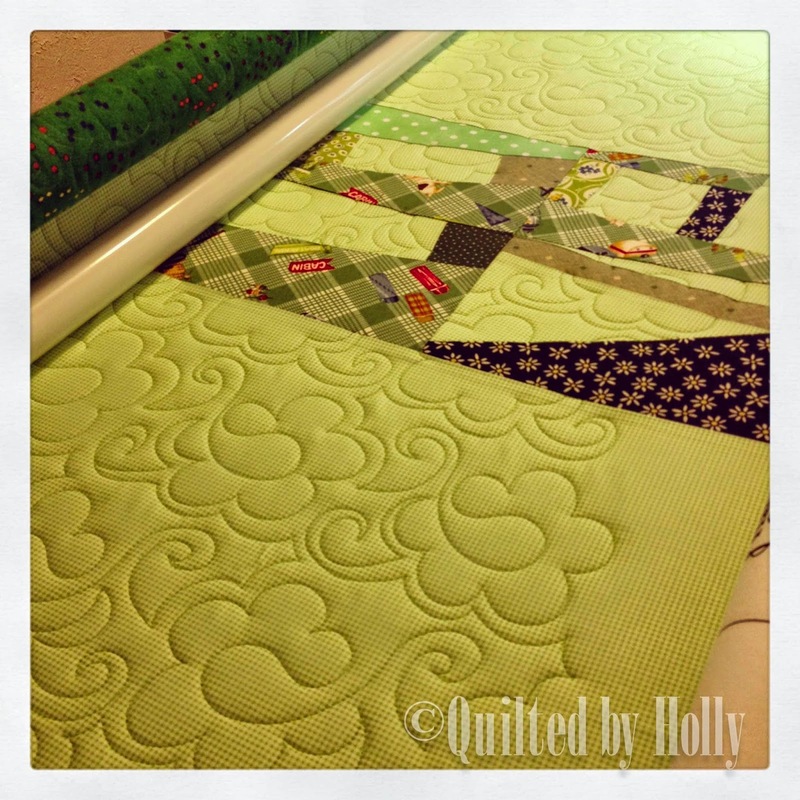 My quilting business is keeping me very busy along with my day job and necessary life happenings like lawn mowing! Some days I am so tempted to hire a house keeper and yard service…perhaps someday I will!! Stipple, it's really one of my favorites! 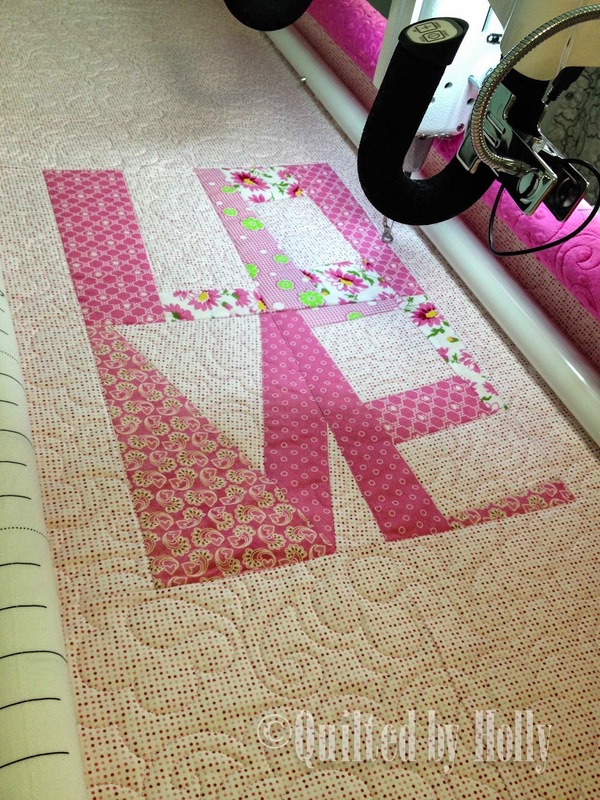 Tami and Ardella's Minnesota quilt on the machine! 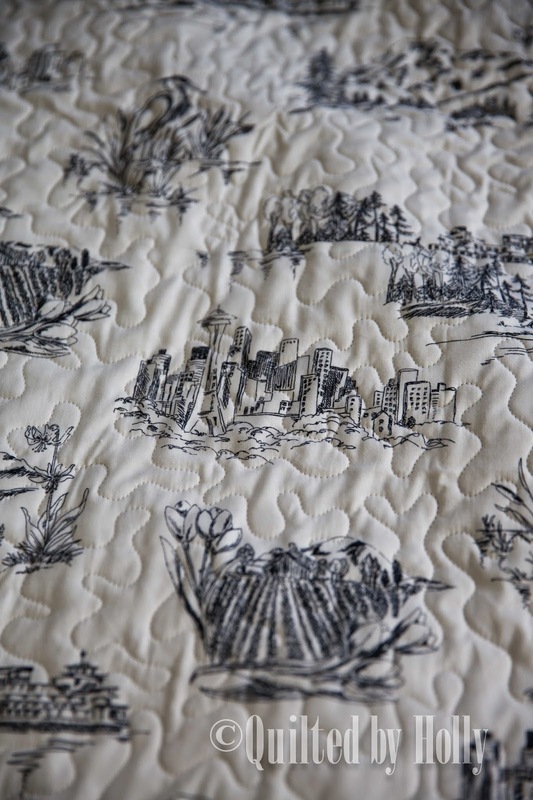 Now I wish I had taken more photos of all this gorgeous fabric with different scenery! 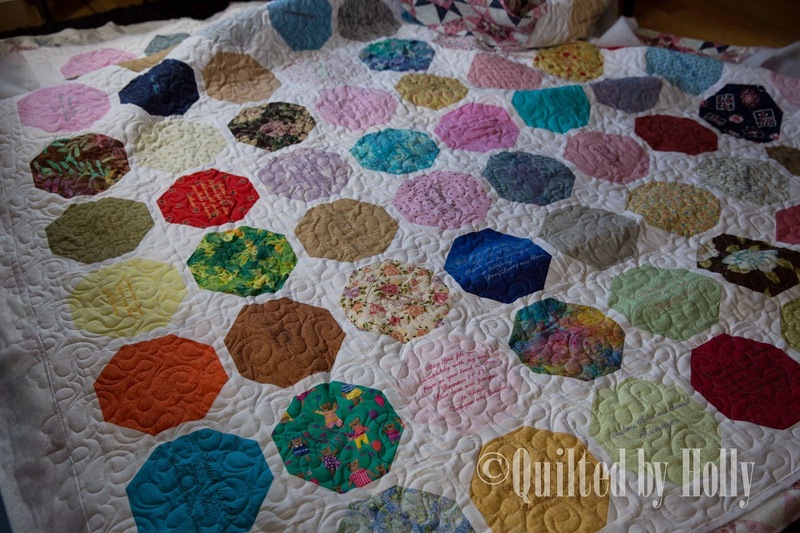 It's a very large quilt! Special thanks to the tall people holding it up!! iPhone photo doesn't do this justice. 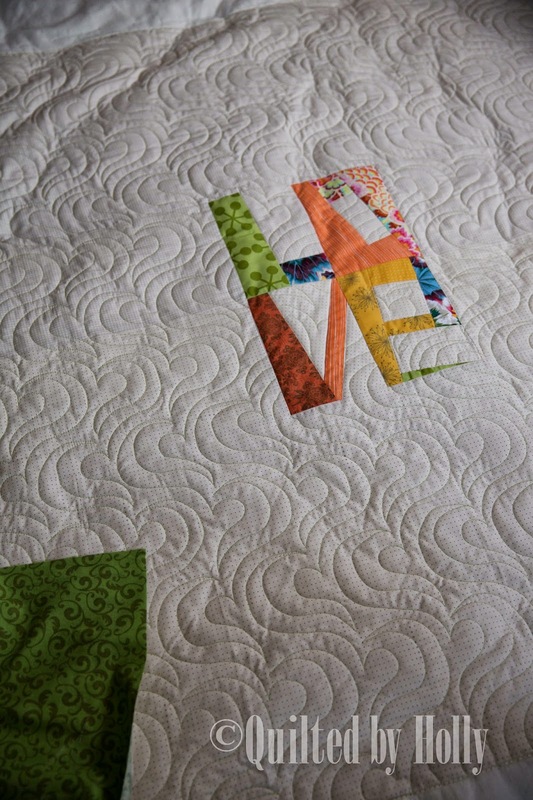 Another love quilt made by Anne.